Named after the Scottish town and river, the Town of Perth was established as a military settlement in 1816, shortly after the War of 1812. Many of the European settlers were military veterans, and a wave of Scottish and Irish immigrants quickly followed. Several Scottish were stonemasons, and their work can be seen in many area buildings and in the locks of the Rideau Canal. There’s little doubt Perth residents remain proud of their history. The restored heritage buildings are a testament to the town’s efforts to honour the past in everyday life. When strolling through town, be sure to look up and take notice of each building’s design and craftsmanship. Did you Know? Perth was the site of the last fatal duel in Upper Canada. 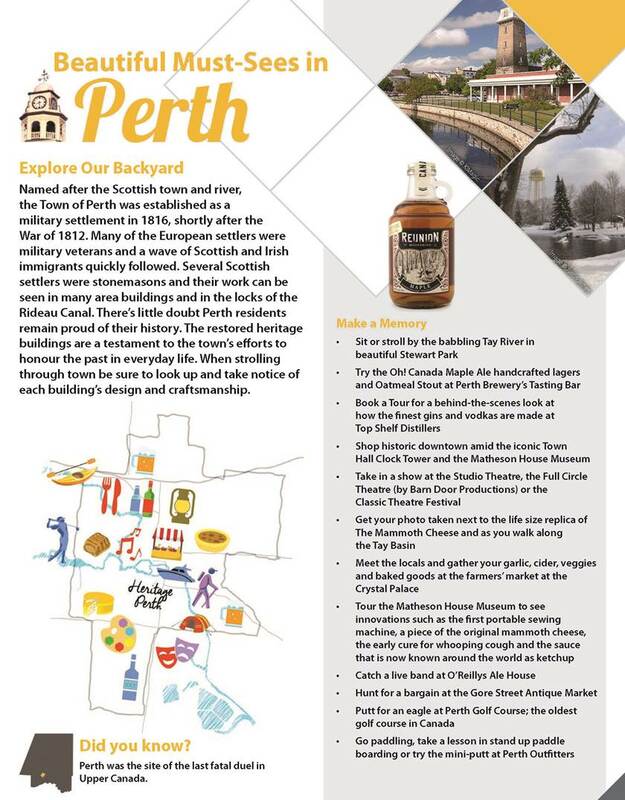 History: Dating back 200 years, Perth carries a rich military and social history. The town was named after the Scottish town and river, and was established as a military settlement in 1816, shortly after the War of 1812. Many of the first settlers were military veterans and a wave of Scottish and Irish immigrants quickly followed. Several Scottish immigrants were stonemasons, and their work can be seen in many area buildings and in the locks of the Rideau Canal. There’s little doubt Perth residents remain proud of their history. The restored heritage buildings are a testament to the town’s efforts to honour the past in everyday life. When strolling throughout town, be sure to look up and take notice of each building’s design and craftsmanship. Signature Events: The festival season kicks off in April with the annual Festival of the Maples, which is the grand finale to the maple syrup production season and takes place in downtown Perth. Hosted by the Perth and District Chamber of Commerce, the day-long event includes entertainment, a petting zoo, vendors and of course, maple syrup products! The Stewart Park Festival is a free, weekend-long music festival in July. The festival remains a favourite for both locals and visitors, as it’s a showcase for musical and cultural talent in a relaxed setting along the banks of the Tay River in Stewart Park. View the large crowd that came out last year below! WIFI in Perth! Now available both downtown and at Last Duel Camp Ground. Use is limited to 50 mgs/day. Use is limited from 8:00 a.m. to 12:00 a.m. midnight each day.